UrbanArt project covers eyesore outside City Hall. Local artist Greeley Myatt remembers seeing beautiful patchwork quilts hanging from clotheslines near his grandparents' rural Mississippi home. Now, thanks to Myatt, urban dwellers can see similar patterns in downtown Memphis. 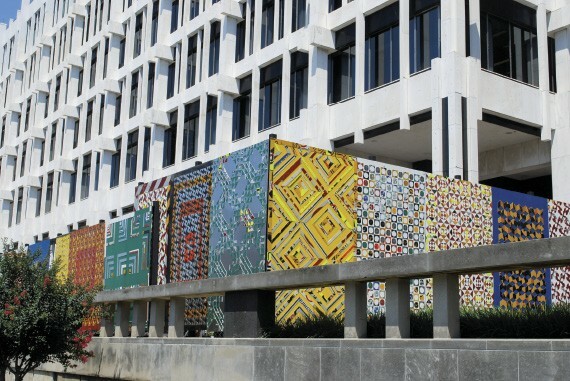 The artist behind the UrbanArt Commission's latest installation, "Quiltsurround," Myatt created 32 panels constructed from old aluminum street signs to hide the large heating and air unit located in the southwest corner of City Hall. The "quilts" were installed last week. "We didn't have a very good budget for this, and the idea of recycling is part of quilting, so I had the idea of taking the street signs that the city was going to recycle," Myatt said. "I knew that material would withstand the outdoors." Using about 700 speed-limit, caution, and stop signs (and even a few Memphis City Beautiful signs), Myatt designed traditional quilt patterns in 4-by-12 foot panels. The panels, visible from Front Street and Adams Avenue, hide a chain-link fence and City Hall's heating and cooling system. "The city contacted us in late 2007 to do something about the eyesore effect of that equipment," said John Weeden, executive director of the UrbanArt Commission. "That unit had been on the roof of City Hall for a while, but for some reason, it was moved to ground level." Not only was the heating and cooling system ugly, it was also refuge for some of the city's homeless. "In the winter, it had become a place for people to camp out," Weeden said. "People were leaving their belongings, and there were sanitation issues because they were improvising with their bathroom facilities. It didn't give the best impression of the city of Memphis." With the help of a few University of Memphis art students, Myatt began crafting the panels last summer. "I started doing a series of sculptures based on quilts in the early '90s. They were painted signs that were cut up and put back together, but they were made out of wood," Myatt said. Weeden was drawn to Myatt's quilted-sculpture idea because of its social and cultural relevance as well as its dual function as both art and a barrier to unwelcome guests. "Quilt-making crosses racial and economic demographics in traditional Southern culture," Weeden said. "Just as a traditional quilt provides warmth, it's also beautiful. And this project both provides a service and is aesthetically pleasing."